DUALLINER. THE BEST BEDLINER FOR CHEVY SILVERADO. You depend on your Chevrolet Silverado, so get the best Chevy truck bed liner that will last the lifetime of your truck. We have a unique combination of cushioned rubber bed mat and hard side wall protection. Don’t settle for spray-on liners that can fade or peel, or drop-in liners that let your cargo slide around. 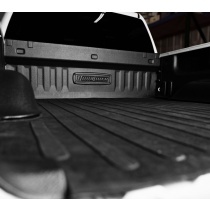 DualLiner’s hybrid bedliners include ZeroSkid® bed mats and custom-fit, polyethylene sidewalls specifically designed for your Silverado 1500, 2500HD or 3500HD truck. If you’re looking for a long-lasting, durable bed liner with a lifetime guarantee, we’ve literally got you and your truck bed covered! We offer a 30-day money-back guarantee, a Real Lifetime Warranty and free shipping in the continental United States. To place your order today, or to learn more about our bed liner products, contact the DualLiner team at (800) 992-1949. DualLiner produces the overall top quality Chevy Silverado bed liner in the industry. Our Chevy bed liners are custom fit to match your Silverado perfectly, whether you have a Silverado 1500, Silverado 2500, or even a Silverado 3500, of any bed length. With DualLiner’s ZeroSkid® rubber floor bed mat, the cargo in your Chevy Silverado will be safer than it has ever been before, and there will be no risk of damage to the cargo, or your truck. The DualLiner Chevy bed liner will also stand the test of time, not like a spray-in bed liner, which is why we are happy to provide a real lifetime warranty. DualLiner has also designed our Chevy bed liners to be incredibly simple to install. There’s no need to go to a dealer, pay a hefty install fee, and wait for hours, or even days. With DualLiner’s Chevy bed liner, you can do the install yourself with just some basic tools and a fraction of the time it takes for a spray in bed liner.